Flashing relay with fixed rythm - 4 CO contacts - 3 A.
Pluggable on socket with possible withdrawal clasp. Pins at the standard pitch of 2.54 mm. Possibility of polarization by mounting a male withdrawal claps on the relay and female withdrawal clasp on the socket. 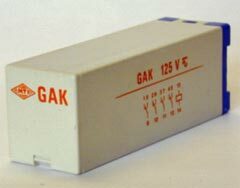 GAK relay is pluggable on the following sockets : EVB/GE, 9877, EVC/GE, 9876, ER/GE 2.8, or ER/GE.
. GAK relay with specific voltages.